KIWA® has a passion for bringing stories to life for the digital generation. This passion has led to some of our most beautiful graphic novellas, and has inspired the KIWA SLAM™ programme. The KIWA SLAM™ is our way of empowering students to become the storytellers of their generation as well as an innovative way to introduce kids to digital publishing. The programme is centred around a two-day event in which students create their own digital books, writing the content, recording a narration of the story, and finally creating illustrations and designing the interactive elements that really bring their story to life. The students engage quickly and become immersed in the process. And, for parents, teachers, and our team, the magic of watching a child’s joy at seeing their work made permanent in an experiential mobile app is unbeatable. The first instalment of our SLAM programme was held in Alaska in 2013, in partnership with the Alaskan Association of School Boards. Backed by research, the programme has developed since then to include proprietary workshop processes and facilitator training. It is now used by agencies ranging from education authorities interested in motivating disengaged students, through to community groups encouraging language acquisition. 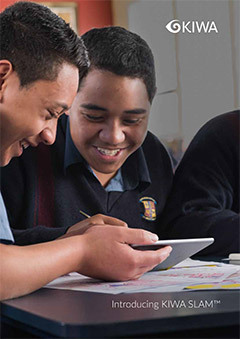 A KIWA SLAM™ programme held at five schools in New Zealand for the Ministry of Education’s “Success for Boys” programme. 91% of students interviewed finished the workshop with high self-efficacy and belief that their skills had improved. In Australia a workshop for primary school students produced a digital book that has received global recognition. Meanwhile on the other side of the world at a KIWA SLAM™ in the United Arab Emirates a group of students have made headlines for being the very first trilingual published authors who are 12 years of age and under. If you would like to run a KIWA SLAM™ in your school or community organisation, please get in touch with our CEO Steven Renata [email protected].